Karakoram Himalaya (KH) has continental climatic conditions and possesses largest concentration of glaciers outside the polar regions. The melt water from these glaciers is a major contributor to the Indus river. 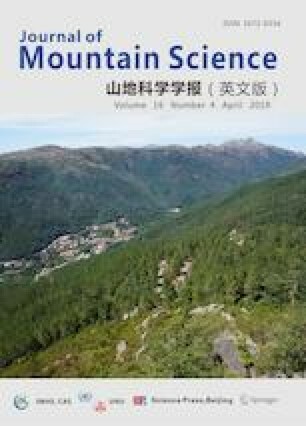 In this study, various methods have been used to estimate the ice volume in the Karakoram Range of glaciers such as Co-registration of Optically Sensed Images and Correlation (COSI-Corr) method and Area-Volume relations. Landsat 8 satellite data has been used to generate the ice displacement, velocity and thickness map. Our study for 558 Karakoram glaciers revealed that the average ice thickness in Karakoram is 90 m. Ground Penetrating Radar (GPR) survey has been conducted in one of the KH glacier i.e. Saser La glacier and the collected GPR data is used for the validation of satellite derived thickness map. GPR measured glacier thickness values are found comparable with satellite estimated values with RMSE of 4.3 m. The total ice volume of the Karakoram glaciers is estimated to be 1607±19 km3(1473±17 Gt), which is equivalent to 1473±17 km3 of water equivalent. Present study also covers the analysis of glacier surface displacement, velocity and ice thickness values with reference to glacier mean slope. We thank Director SASE, Chandigarh for encouragement and providing support to this work. We are thankful to Department of Science and Technology (DST), New Delhi for financial support to project no. SB/DGH-102/2015. We are grateful to the US Geological Survey for its free data policy and allowing us to use Landsat images and ASTER DEM for the analysis. We also acknowledge S. Leprince et al. for providing the COSI-Corr module freely available on internet.